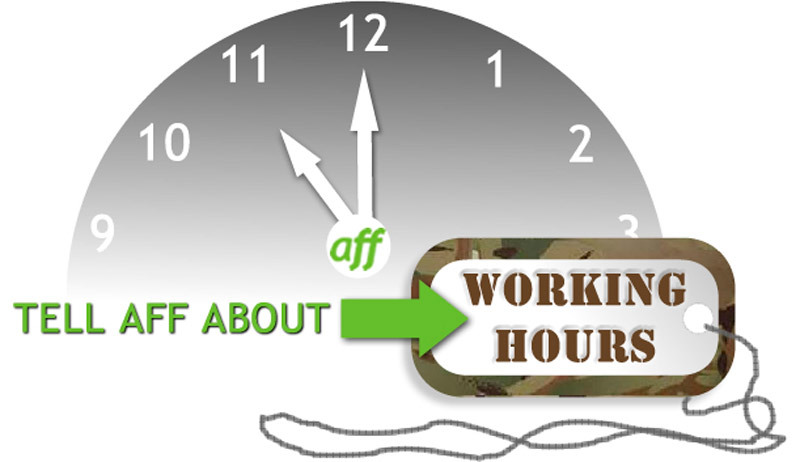 AFF needs to know what sort of hours your soldier is working. We’re trying to find out if redundancy, restructuring the Army and rebasing from Germany are affecting time spent with family and your quality of life. working hours have increased meaning that some spouses have had to quit their job because of their soldier’s erratic hours or pay for more childcare. 75% of respondents so far said that their soldier had been unable to take their leave entitlement and over 50% worked regularly at the weekends. …but we need as much information as possible to provide a true picture of what Army life looks like since defence cuts have started to bite. By answering our survey you’ll help us to get a fair deal for Army families. The survey is anonymous. Please help us to reach as many families and soldiers as possible by forwarding this survey to your family, friends and colleagues.